In – sight out opens this new section with the review of the acclaimed movie ‘Jagten’, in which the director Thomas Vinterberg explores the hunter-prey analogy. The movie touches the sensitive topic of child sexual abuse. Photo taken from Internet. Sometimes even the most skillful hunters become the prey. They are patiently hiding under the cover of trees in an ambush. They are confident and their hands will not tremble pulling the trigger. And yet, in a blink of an eye, the world they are living in can lead them into an unexpected trap. Instead of being hunters they are the prey, both in psychological or even physical way. This hunter-prey analogy is central in Thomas Vinterberg’s critically acclaimed ‘Jagten’ (The Hunt, 2102). While touching on a very delicate and sensitive topic – child sexual abuse – the director explores this analogy from an unusual angle, reversing participating sides. For the community of a small Danish village, hunting is almost a ritual of exercising manhood with preparations, feasts and ceremonies of admitting teenage male siblings into the hunting club. It is a style of life, if you like. When one of its members is falsely accused of sexual abuse, he becomes a prey. The movie starts with tranquil shots of the Danish village preparing to celebrate Christmas. In this village, as certainly in most of the others, life is leisurely plain. Everyone knows everybody, no secrets are kept, no surprises are expected. However, this countryside tranquility of the first quarter of the movie would not in any way deceive the viewers, as it is certainly clear that the echo of any possible misdeed, alleged or actually committed, will shudder this small community to a state of ugly revelations. Lucas (Mads Mikkelsen), a lonely kindergarten teacher, lives a serene life, simple and honest. He is divorced and he learns early on in the movie that his teenage son would move leaving with him. He starts a new relationship with his work colleague. And he is an avid hunter. But his life is about to change almost irreversibly, when one of the children in a kindergarten, Klara (Annika Wedderkopp) tells a lie. It is one step from love to hatred with children. When earlier in the movie Lucas confronts Klara about the small present she has sneaked into his pocket in an act of admiration, she is hurt. And she invents a lie, that she was sexually abused, certainly having a childish grudge to bear, and of course unable to perceive the meaning of this lie and what the destructive force this lie would have. Acknowledging between the lines that children, victims of actual abuse, are traumatized to a degree when they even experience memory loss of the episodes of violence, Vinterberg shows how a false allegation which started as a product of a child’s imaginative lie, can transform man’s life from an honorable member to a social outcast. “I always believed children. They never lie”, the head of kindergarten shouts to Lucas. In ‘Jagten’, adults, acting on this principle alone, are pushing for answers, and Klara, so confused by people around her asking questions about male reproductive organs, finally loses track of what is true or false. In her imagination her lie becomes the truth. What follows next is sad to watch, as it tells us another story of how misjudgment and mistake open up a way to cruelty and moral ugliness. Watching Lucas, masterfully played by Mads Mikkelsen (who won the Best Male actor prize at the Cannes Film Festival for this role) is a fascinating stuff. Being a man of strong moral principles he earnestly cannot grasp the very possibility of situation he has ended up in. When confronted by his girlfriend he keeps repeating: “do you really think Im an abuser?”. Wherever he goes, to the head of kindergarten, to his best friend and Klara’s father, he does not try to justify and explain himself; he rather asks people to explain him what is happening. And then, confronted, humiliated, assaulted, unable to take it anymore, he loses himself to an emotional outburst. Vinterberg creates and executes a brilliant palette of emotions in the movie, first starting with serenity and quietness, then slowly moving to an almost itching sense of uneasiness, and then, with every scene, making crescendo strokes and reaching the peak of confrontation in the best scene of the movie. In this scene Lucas goes to the Christmas mess to a local church, where the whole community is gathered. He is like a man with leprosy, sitting alone on a church bench, with people looking at him with disgust and contempt. 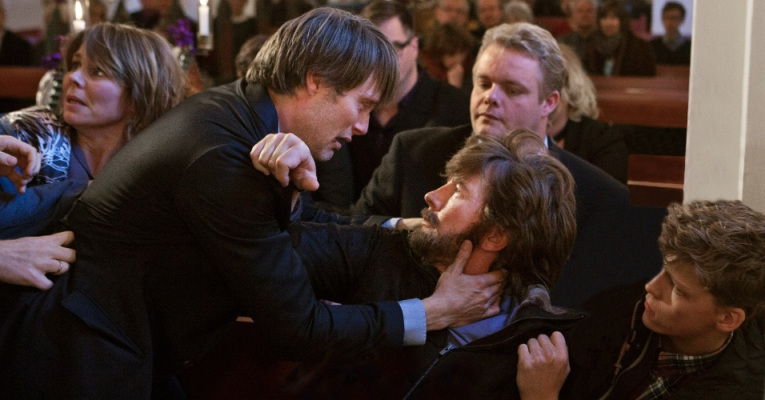 And here Vinterberg brings up the religious aspect as well, with an inevitable musing on how religious piety on one side, and cruelty, inability to listen and hear, and condemnation on another can co-exist in one room or in fact in a certain one person. Mads Mikkelsen won the Best Male actor prize at the Cannes Film Festival 2012 for his role in Jagten. Photo taken from Internet. The allegations against Lucas do not hold in the end. He is cleared up, Klara admits her lie and her father (Thomas Bo Larsen) goes to his best friend to reconcile. They sit in the dark opposite each other, and we do not know where this would end. Some – myself included – would probably gather things up, call it quits, and move to another village, town, anywhere, unable to get on with people who so cruelly turned their backs to him. But Lucas stays as a loyal member of the community. A year later it seems that everything has lead back to where it belongs in this traditional Danish village. The serenity is restored; Luсas is back to the circle of neighboring friends and on the hunting path. In a final, beautifully rendered scene, waiting for a deer to appear he waits cautiously behind a tree in a forest, and suddenly a bullet whistles its way in some millimeters off his head. Vinterberg leaves the ending inconclusive, as we are left to guess whether this shot is a warning from the community that Lucas is still an outcast or that it is simply his imagination playing tricks with him. ‘Jagten’ is a brave attempt from one of the top Danish movie directors to explore a very sensible topic: the problem that leaves many young human lives horrendously disfigured. Showing us another side of the problem, it does not try in any way to speculate on the importance of it. What this impeccably acted movie shows us is that the world in the end is still all about “hunters” and “prey”.